From some of the previous photographs in posts, you may have guessed that the electrics in my dolls house have all been wired in. I am not an electrician! However, I did marry one, and thought that this would be a HUGE help when it came to wiring and electrics. That is not how it happened. "And the dollshouse is YOUR project" He replied bluntly. I had to sand grooves in the floors of the dollshouse (I am also NOT a carpenter! ), drill holes through the walls, and wire up tiny ickle little wee lamps and bulbs and plugs. It took me two days in all. I had to strip the larger 12th scale plugs from the lights, and replace them with tiny 1:24th scale plugs. 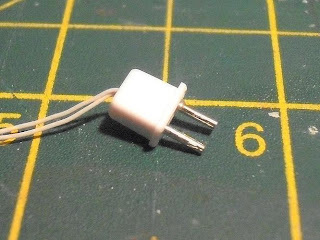 The tiny wire had to be split and exposed at the ends, threaded up the middle of the plug and folded back into the holes where the pins were to be put in. ARGH!!! This was only slightly more difficult than putting the 2-pin bulbs into the itty bitty lamps. I also had to build the fireplaces for the 'working' coals and logs, back them with heat-proof paper and thread the bulbs in through the back of the log-effect. When it was all finished, I plugged in the mains.... and two of the bulbs didn't work! I know that a multi-coloured lit-up Christmas tree isn't partiularly victorian... but it looks kinda sweet in the corner.